4 blade, 82" RH 14"
Caterpillar D348 V-12 diesel engine manufacturer rated 670hp @1,800 rpm. Serial Number: 359387. Air start, dry stack exhaust. Twin Disc 527 transmission with 5.17:1 reversing reduction gear. Steering is Sperry hydraulic with Mathers cable propulsion controls. Auxiliary machinery includes a 3.8L Newage Marine diesel engine powering Vickers hydraulic pump and Gardner 2-stage air compressor. This generator features a radiator that permits operation when out of the water. A Westerbeke 12.5 KW generator provides ships power and is currently not connected. Hull construction: 3" Douglas fir planking on 8" x 9" fir futtocks (ribs), trunneled fastened (wood pegs) and iron boat nails. Douglas fir keel, fir decking. Three watertight bulkheads. A survey from August 2017 found the construction sound with no significant structural issues. Boat has been substantially restored. Waterline Boats / Boatshed does not independently verify capacities and measures, which are reported from seller-provided information and/or literature. The interior is laid out for two staterooms and a galley with dining area. Enter from multiple doors port and starboard to the galley dining area. Here a stainless steel countertop and sink have been built in with cabinetry and an apartment sized refrigerator. The ceiling is trimmed out with pine. You'll find the original conventional doors and dutch doors to access the cabin from several places. Forward of the galley is a cabin with a double berth. Midship you will find an athwartship passageway. Here, the tiled head compartment is accessed which includes a shower. An electrical panel is in this passageway as is access to the engine room via a steel ladder. Forward of the passageway is another cabin with a double berth. The pilothouse is accessed via a starboard passageway and short ladder. The curved pilothouse is fully functional. A large chart table is aft in the pilothouse with commercial electrical panels port and starboard. The boat is steered hydraulically, and a Sperry steering system is installed at the helm which provides for reliable control. From the athwartship passageway and down the steel ladder you can access the massive engine room. On the foredeck, a steel hatch leads down a ladder to the forepeak. There is a rough frame for a berth, but no other finishing. The intent was for this to be an additional stateroom when finished. The anchor chain locker is all the way forward in this space. Massive Navy-style anchor with hydraulic windlass on foredeck. - Navigation Equipment: Simrad (GPS chart plotter, marine radar, and depth finder - 2017). - Marine Radiotelephone: SH Quest (2017) and Cobra VHF (fixed station) with (3) portable, hand held VHF radios. Two (2) electric bilge pumps and one large hydraulic 2" pump with 4 suction lines and manifold valves. This system serves for water removal or fire suppression through hoses. New 406 Mhz EPIRB, liferaft, offshore life jackets. VIRTUAL TOUR - VIDEO - 80 TO 100 PHOTOS - FULL SPECS CAN BE VIEWED OF THIS VESSEL! This historic Canadian tugboat was built right in the first place and has been substantially restored in structure and systems. The boat was central to a business plan for chartering, and as such it was thoroughly surveyed last year and noted deficiencies were addressed. You will find big ship systems in this offshore tug that perform well. The electrical panel and AC systems are first rate marine commercial grade. Two diesel generators provide for ships power and systems operation (air and hydraulic). The Caterpillar D348 V-12 marine diesel has been serviced including a rebuild of the heat exchanger. The two 2,500 gallon fuel tanks were thoroughly cleaned. This boat is operational and includes a liferaft and other safety systems for offshore voyaging as the business plan involved transit to Mexico for charter work in Los Cabos. The topsides cabin and pilothouse were worked on to install a new upper deck roof, pilothouse roof, staircase, head compartment, wiring and interior. The main cabin, master stateroom, and galley have been trimmed out and finished. The aft deck has a new seating area installed as well as a staircase to the restored upper deck. In addition, a large forepeak space could be converted into a private cabin. This is a restored historic commercial tugboat that is ready for use as a liveaboard, charter boat, or continued operation as a commercial vessel. 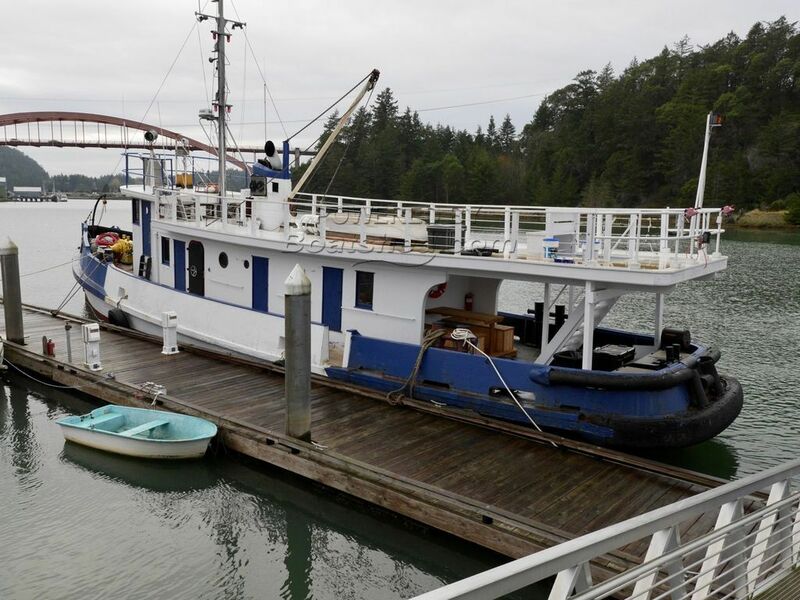 This Converted Tug Wallace Shipyard has been personally photographed and viewed by Brian Moratti of Boatshed Port Townsend. Click here for contact details. Please note this comments section is public. Please do not post your personal details here. To enquire about purchasing this boat, please contact the broker directly at brianmoratti@boatshedporttownsend.com. Please read our commenting guidelines before posting.